Since there was no dental school in England until 1858 and no regulation of the trade, it was very easy for an untrained person to advertise and operate as a dentist. Although the Dentists Act of 1878 specified that no-one without dental or medical qualifications could be registered or use the title 'dentist' or 'dental practitioner', unregistered persons might still operate under such alternative names as 'dental specialist', 'dental consultant' or 'dental expert'. For both reputable dentist and charlatan, the main profits came from the sale of false teeth - prominently illustrated here by the surgeon dentist, Mr G W Clements. By the end of the 19th century, dentures made of vulcanised rubber could be moulded and coloured to match the natural gum and fitted with porcelain teeth. These might improve mastication and articulation and restore a natural appearance. In the final decades of the century, dentists were also able to offer nitrous oxide gas as an anaesthetic for the painless extraction of teeth. 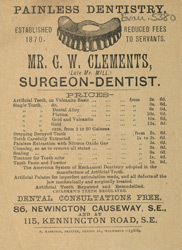 It is interesting to note that Mr G W Clements offers a range of other services including cleaning, scaling, the regulation of children's teeth and the sale of tooth paste and powder to enhance his patients' appearance and prevent future damage.